Assisi’s famous Basilica of St. Francis consists of two churches stacked on top of each other. Both are pilgrimage sites for followers of the saint, who died in 1226, and art enthusiasts entranced by the frescoes that tell his story. The Lower Church, a kind of Romanesque basement, was built to house Francis’ crypt. The Gothic-style Upper Church is a lighter, taller space designed as a meeting and worship hall for priests and the Pope. The Lower Church was painted most likely in the early 1300s by Sienese artists Simone Martini, Pietro Lorenzetti and followers. The Upper Church was frescoed in the late 1200s with scenes of the saint‘s life by Giotto (circa 1270-1337) and biblical tales by Cimabue (circa 1240-1302) and others. Additions and changes continued over the centuries, and even the saint’s tomb was long hidden under an altar before being rediscovered in 1818. 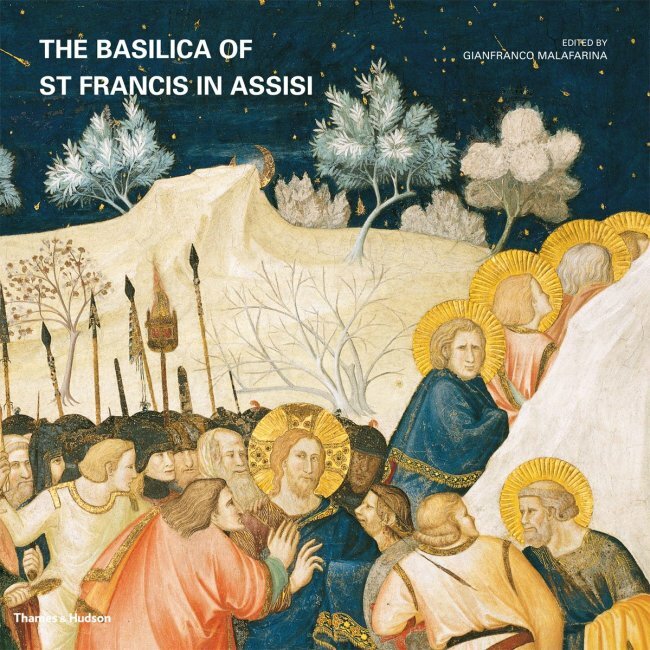 “The Basilica of St. Francis in Assisi,” edited by Gianfranco Malafarina, is a photo-rich volume written by notable Italian art historians and ecclesiastical scholars. The book’s photos are glorious ― detailed close-ups of images that are virtually impossible to see in the dark stone building itself. Vividly colored and well chosen, they convey the austere beauty that has mesmerized viewers for centuries. Special sections are devoted to St. Francis, barefoot but clad in a robe embellished with gold, or huddled in a humble cassock that reveals his Christ-like wounds, or bearded and beatific on a pink cloud. Parts of the text are a thick stew of church history, papal decrees and Franciscan miracles that may enthrall devotees of the saint but are heavy going for secular readers. But other sections read like step-by-step guides to scenes and narratives. Scholarly squabbles about who painted what are noted, along with explanations of stylistic shifts, deteriorated paint and lost colors. Tragically, on Sept. 26, 1997, sections of the Upper Church’s frescoes were shattered in an earthquake. Apparently some of the photos were taken before the quake, and in some cases, the book’s captions have to be read closely to determine what is intact and what was lost. When I visited the basilica the following spring, tiny fragments of the 700-year-old paintings had been carefully sorted ― by color and design ― into plastic tubs in the restorers’ workrooms. The basilica was still closed to the public, and unstable buildings throughout Assisi were buttressed with scaffolding. A few journalists were allowed into the churches briefly, and only because another minor quake had shaken the town that weekend. Officials wanted to assure the public that no further harm had befallen the site. While the vast majority of the basilica was intact, there were gaping holes in some paintings and ceiling vaults. Unfortunately, even the most zealous restorers couldn‘t entirely put that Humpty Dumpty together again. Four of eight pairs of saints by Giotto and assistants were destroyed, along with parts of various vaults, spans, ceilings and other decorations. Nevertheless, the damaged art was patched up when possible, and within a few years the churches were back in business.